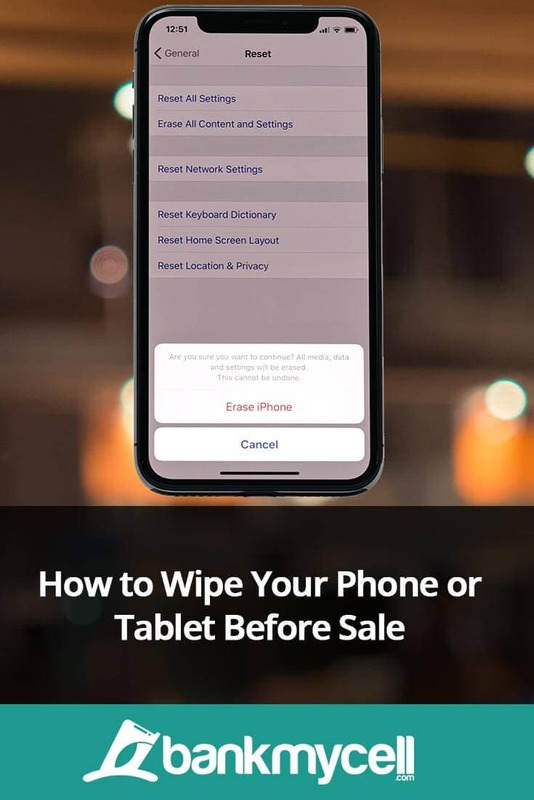 If you're looking to sell your phone, but you're concerned about the personal information and media that you have stored on it, one way to ensure your privacy and security of your data is to fully wipe the data on the phone. However, this can be a bit of a complicated process and it can vary from phone to phone. Keep in mind that – short of the destruction of the phone’s hard drive capacity – there is no way to completely wipe your data from a phone with the proper data recovery tools. However, you can wipe the data so a normal operator will not be able to retrieve this data or have easy access to it. This guide has directions for working with the main operating systems of phones that are in common usage today, but if you have an older phone, it may have an OS that isn’t covered here. The manual of this specific phone may have directions on how to accomplish a successful wipe of the data. Before starting the process of wiping your data, ensure that you have saved all the data you want to save (such as contacts, pictures, etc) to another device. You should also delete permissions that this device has to access any of your social media or financial accounts, as well as uninstalling the apps involved. You will also need to remove any removable storage device, such as the SIM card or SD card. You may maintain possession of these components or wipe the data from them separately. It is also advised that you keep a record of the serial number of the device on file, in case you need it at a future date. There are certain hurdles you will have to overcome in order to wipe the data from your Android device. Some newer Android builds include factory reset protection (FRP) which will render the device inoperative after a reset and require the previous user data and password be entered to reactivate it. This is a well-intentioned anti-theft measure but is also a hindrance for attempting to resell your device. If you want to successfully exchange your phone, you will need to disable the FRP prior to other steps. This will be a process you begin by turning off your screen lock features (pin, password, fingerprint, facial recognition etc) by following this path on the setting menu: Settings > Security or Lock Screen Security > Screen Lock. Once there set screen lock to zero. You will also need to remove your Google account from the device by following this path: Settings > Users and Accounts. Once at this destination tap on your account information and select Remove. If you happen to have a Samsung device there may be an additional Samsung account you need to remove the same way. If your device does not have FRP, you may proceed to the next step. The factory reset option will prepare your device for sale, but there are additional steps you must take to ensure that it is more difficult to access data below the application level such as SMS or chat message data. First, check if your device is encrypted by default (a feature usually found on Android Marshmallow 6.0 or later). To encrypt phones that lack this feature go to the settings feature and select the option to encrypt your data. Keep in mind that this may take an hour or longer for your phone to accomplish. If you have ever set a passcode on your iPhone or iPad on iOS 5 or later, the encryption key will also be overwritten and make data retrieval more difficult. The difficulty of resetting apple devices may come from them being paired with other devices such as a tablet or apple watch. To begin, ensure that you have unpaired these devices so there will not be a data trail to follow. You will also need to turn off the “Find my iPhone” feature following this path: Settings > iCloud > Find My iPhone – You may need to enter your Apple ID password. The path to accomplishing this through iOS 10.3 or later is as follows: Settings > Your name> iCloud > Find My iPhone – You may need to enter your Apple ID password. Once this is done, you will need to manually turn off and/or sign off other services which may contain your personal information such as the App Store and iMessage. It is advisable to sign out of all social media and apps which contain your personal information. Next, you need to completely sign out of the iCloud by following this path: Settings > iCloud. Once there, select the Sign Out option. For iOS 10.3 and later this can be accomplished by following this path: Settings > Your name> Sign Out. iOS 7 is unique in that you can accomplish this by using the Delete Account option. As a word of caution, if you delete your data without signing out of iCloud first it will also delete your data from iCloud which will affect your ability to access it with other devices or lose it forever. The wipe process is started by following this path: Settings > General > Reset > Erase All Content and Settings. You will also need to visit appleid.apple.com to remove the serial number of the phone from your Apple account profile. While this OS is no longer supported, there are still plenty of Windows phones on the market. These phones only offered encryption options for business customers. In order to complete a factory reset you will also need to load dummy data into the phone to overwrite the original data you no longer wish to be accessible. First, you need to start the reset by following this path: Settings > About > Reset Your Phone. After confirming the action it will take some time for the phone to wipe. Once this is wiped, you will need to connect the phone to a Windows PC or laptop and open the My Computer app. In this window, find the removable device icon that is associated with the phone. You will need to load dummy data into the device by dragging and dropping it from your computer. This should not be personally identifiable information or media but rather neutral data like MP3 files of songs, movies, or the metadata from video games. Try to fill the folder with as much of this as you can. After this, you will need to reset again and repeat this process up to three times to ensure that all original data is completely overwritten. The final step of the reset will be to visit your Microsoft account and remove the phone from your account. You may also need to revoke access that your phone had to any social media platforms where you had simplified sign-in privileges. Do you need to learn more about how to protect your information when selling or trading your phone? Contact Us for more information or guidance on how to sell your device. Let me know any feedback by leaving a quick comment below right now!